Reports of legendary actress Sridevi’s biopic is going all over the internet. 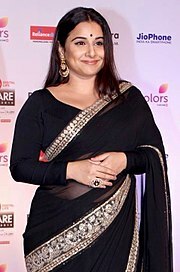 In a recent interview, one of the ace actors of Bollywood Vidya Balan told that she is open to do the role of Sridevi in her biopic as a tribute to the late actress. She even said that she will be happy to do the character. She further told that she grew up with the feeling that Sridevi is super important person in her life and thought that’s all makes the difference. When asked about the role, she said that it would need a lot of guts for her to portray her but as a tribute she would definitely do it. She was such an ace actor in Indian Cinema, she further added. Meanwhile, on the work front, she will next be seen in Telugu film ‘N.T.R: Kathanayakudu’ and a Hindi film ‘Mission Mangal’ which will be released in the month of August this year.